The mayor of Pointe-Claire, John Belvedere, and the members of City Council are proud to announce that the average satisfaction of residents with the frequency of the various waste collections offered by the City is 88%. “The satisfaction of our residents with all of the collections we offer is important to us, and we will continue to improve the services we provide in order to give current and future generations the best possible environment,” stated Mayor John Belvedere. An independent professional firm conducted the telephone survey among Pointe-Claire citizens aged 18 and over. Over 700 people from the eight municipal districts participated, representing young families, seniors, students, workers, owners, and tenants. The recyclable and organic waste collections received the highest satisfaction level of 98% thanks to weekly collections and tools to help residents participate in the collections, including the Waste Collection Guide, the Waste Management Squad, the children’s book Leonard’s Composting Adventures, educational activities in schools, and the online material search tool. The household waste collection every other week received a satisfaction level of 56%. With the addition of a weekly collection during the summer, satisfaction reached 92%. For the second year in a row, household waste will be collected every week during the summer in 2019. The seasonal leaf collection, the bulky item collection and the Ecocentre Days also received results of 94%, 92%, and 93% respectively. The satisfaction level for the door-to-door upholstered item collection was 90%. 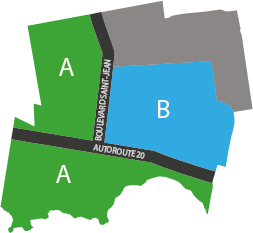 In order to improve the services we provide and increase their efficiency in 2019, the bulky item collection will alternate between Sector A (the entire area west of Saint-Jean Boulevard and the entire area south of Highway 20) and Sector B (the area both east of Saint-Jean Boulevard and north of Highway 20). “Protecting the environment is very important for our residents. It is important for us to listen to their needs in order to provide high-quality, adapted services to protect our environment,” said Mayor Belvedere in conclusion. You can learn more about the various collections offered by the City in the 2019-2020 Waste Collection Guide, which will be distributed from Thursday, March 21 to Saturday, March 24. For full details about the telephone survey, click here.